The best tool for beginner and intermediate users to build wordpress forms just by drag and drop within minutes. Landed here to know about the latest wordpress forms builder plugin WPForms? Then you’re at the right place and in this article, I am going to share WPForms Review and discuss its features, how to use it, pros, and cons. WPForms is one of the simple and easy to use drag-and-drop wordpress plugins which offers an outstanding and powerful functionality to create numerous type of forms. It is developed by Syed Balkhi and the team behind OptinMonster and Envira Gallery wordpress plugin. Both plugins are known as the best in its class, and I am pretty sure this new one WPForms will also becoming popular among wordpress users SOON. It has a great control panel to create different forms such as simple contact forms, newsletter forms, donation forms, billing or order forms, and much more within 2~5 minutes. Isn’t a great tool? When I came across to the plugin, I thought it will be like old plugins as some others such as contact form 7, which need placing various code to build contact forms. Contact Forms 7 is one of the most popular plugins in wordpress plugins repository, but it’s little complicated for absolute new bloggers. Here is another plus point in using WPForms Plugin, it is way better and simple to use than Contact Form 7 to build forms for your wordpress powered websites. As I mentioned above that Syed Balkhi, Jared Atchison, Thomas Griffin and the entire team who build OptinMonster and Envira Gallery plugin developed this plugin. Syed Balkhi: I don’t think I need to explain who is this guy. If you’re a wordpress user, then you will know about him. The man behind the world largest wordpress tutorials sharing site WPBeginner. He has been featured in WashingtonPost, Inc, Forbes, Entrepreneur, and many others. Jared Atchison: Jared is the CTO and co-founder of this plugin. He knows as an expert wordpress consultant who turns his client ideas into reality by coding. Worked with giant internet companies such as LeadPages, ShareASale, and GolfStats, etc. Thomas Griffin: With the abilities of building products for mass market, an expert in developing digital products, he is an advisor at WP Forms. Thomas is also the co-founder of Soliloquy, Envira Gallery, and OptinMonster. And all the team members of wpbeginner. WPForms Plugin is the most beginner level drag and drop addon. It comes with a bunch of advanced functions and features that provide the freedom of building the various type of forms just by using a single plugin. Let’s discuss the core features of this tool to find whether it’s worth using or not. 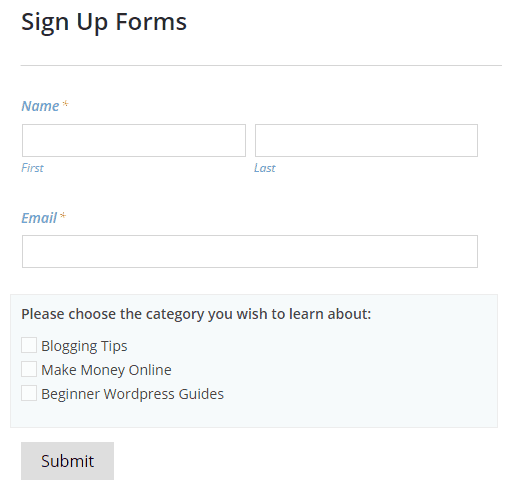 As I mentioned above, it is easy to use, drag & drop wordpress form builder tool which absolute beginners and intermediate bloggers can use for building numerous type of forms like product order, newsletter signup, donation and quotes forms. You don’t have to know about coding, HTML or CSS for designing forms, just use your mouse and create excellent, simple and decent looking forms within minutes. I hear for the last couple of years that your site should be mobile friendly and responsive. And Google is also taking it serious when ranking websites. WP Forms wordpress plugin is completely mobile responsive. No matter from which platform or device your visitors come from, it will adopt the layout according to the device screens whether it is mobile, tablet, or desktop. No more fake and bots submissions because it uses reCaptcha service and HoneyPot feature to reduce spam messages and fake entries. You can easily integrate reCaptcha by adding Site and secret key. reCaptcha is a free service by Google Inc. to protect your site from spams. Using email marketing service? don’t worry. It has the feature of connecting or integrating functionality with MailChimp and Aweber, right now. You can easily attach both services just by adding API key and choose a list, in which you want to add new subscribers. After connecting, it’s easier to create MailChimp and Aweber signup forms within wordpress to grow your email list for increasing subscribers. WPForms plugin comes with pre-designed templates which users can quickly use to taking benefits from it. All you have to do is, choose the desired option and modify it as per requirement, hit the save button and you’re ready to go. Isn’t simple and easy to use? With the conditional logic feature, you can show or hide entirely different options, fields, and send particular notification in front of your visitors/clients as per their choice. In simple words, it shows/hide options as per user selection. It is the best feature for agencies, publishers, sellers, and surveys. With this functionality, you can collect more specific and targeted data about your clients to offer most relevant stuff. As headline describes, whenever you receive any message from your clients, customers, and readers, you will be notified instantly via email as well as inform multiple persons at the same time. This is perfect if you have a customer support team to help clients. Bloggers can also utilize it, if there are more than one comment moderators on the site, So, they will receive email and then reply to it as soon as possible. In my perspective, it will help you build trust, authority and show how serious you are about your business. Because, when a new customer receives replies to their queries more quickly, chances are he/she will buy products. However, anyone can use this features according to their situations. So, you have created a form with many fields or aimed to collect detailed info about your site users? A long form can frustrate users to fill it, why not to split it into multiple pages to increase engagement? So, anyone comfortably fills it. WPForms plugin can break your long forms into pieces. Just click on the “Page Break” option while creating long forms and drag & drop page breaker where you want to split it, now you are good to go. It creates paginations to go to the next page. Page Breaking also can be used in multiple pages based signup forms, product orders, multi-page job hiring form, patient data collection, etc. It’s on to you how you use it. Have an eCommerce, products selling or donation collecting site? You can easily connect your site with Paypal to receive payment in your account. It gives the ability to your users to upload files such as PDF, images, videos, documents through wordpress forms. Users can only upload a certain type of files with the limited maximum size limit. You can use this feature if you offer guest blogging on your blog, so the guest blogger can easily use it to send you articles. Following was the top features that I think you must know, there are some others too. WPForms Plugin offers a broad range of functionalities to create a different kind of form as well as five pre-designed templates. 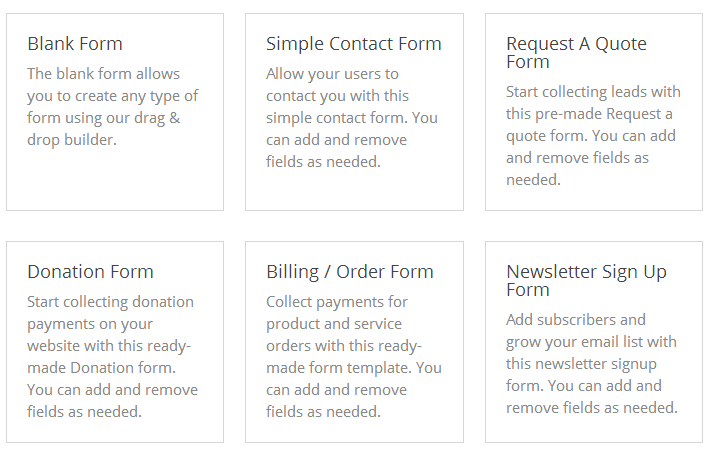 You can create forms from scratch using blank template, simple contact forms, newsletter forms, quote forms, donation forms, and order/billing forms. Blank Template: Love to create your stuff from scratches or a unique one? Then choose the blank template and start making your custom design by drag and drop. No need for any coding skill, create forms within a matter of minutes. 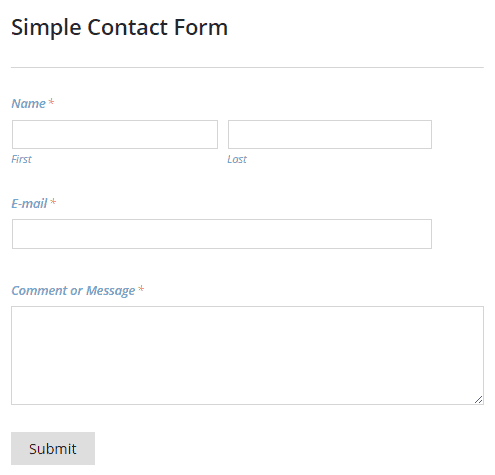 Contact Form 7 known as the simple one but it is the simplistic one I have ever used for creating forms. Simple Contact Form: Choose this option to create simple contact forms which your clients, readers, and visitors can use to communicate with you. However, it will save you time which you will invest when creating a custom template yourself. You also can modify and add different fields in it by drag & drop. 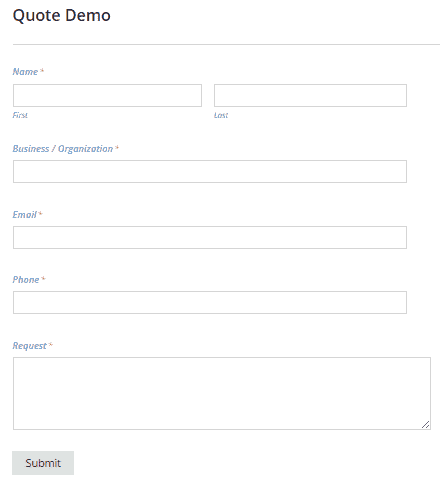 Quote Form: This pre-build template has some extra input fields than simple form such as fields for entering business/organization name, phone number, etc. that your clients can use for quotes or other information. 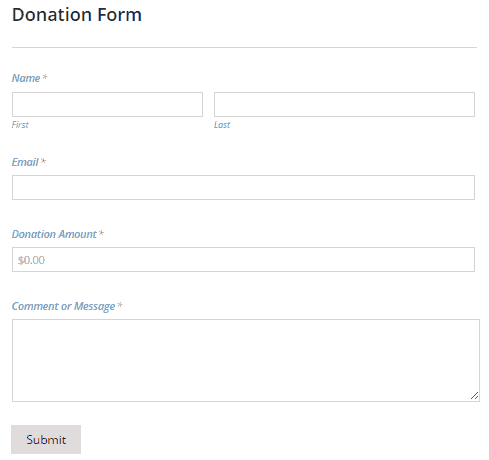 Donation Form: Having a donation-based website or wants to collect for your site? Well, you can use this option for building donation forms. No need of any additional plugin for this purpose, this why I prefer WPForms over Contact Form 7. But keep in mind, whenever you create this form, you should configure your payment collecting service. Right now it supports Paypal, but I hope in future updates it will support other payment processors too. 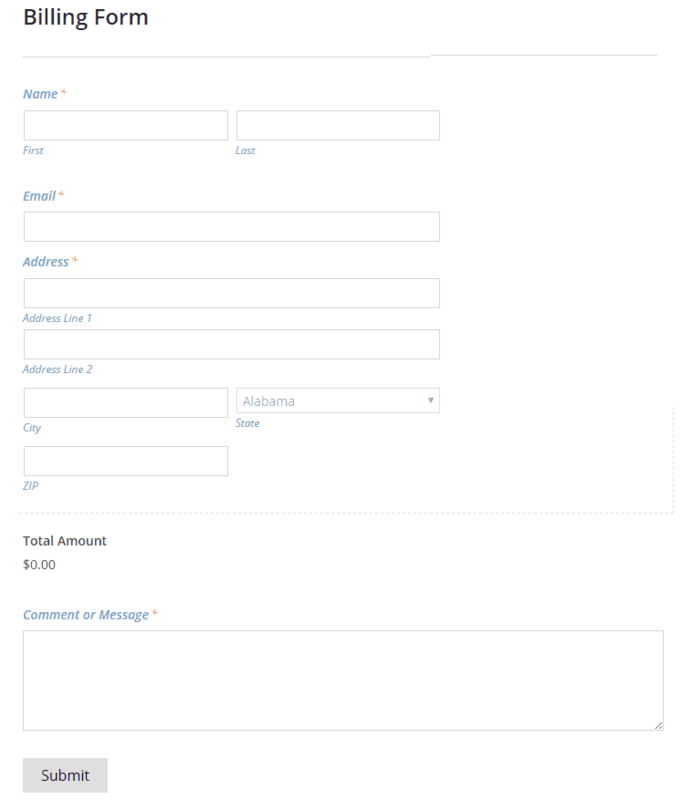 Billing/Order Form: This option can be used for building wordpress forms to receive payments and product orders. This form also has extra input fields, and you can modify or add more fields in it to create your desired form. Newsletter Signup: Select this template to use pre-made signup forms and start collecting emails. You can easily integrate it with your email marketing services such as MailChimp and Aweber. At the time of writing this WPForms Review, it supports only two services, but I am pretty sure in future it will support all the leading marketing services. Building email list is one of the most important and crucial factors in blogging and online business. Every business should collect the e-mail address of their clients and customers. Because, when you have emails of your clients you can notify them about latest products as well as recommend best tools. How to Create Forms with WPForms Plugin? Creating forms with this plugin is very easy as its developers claim that it is most beginner friendly and easy to use. After installing and activating the plugin, you will see a new option in your wordpress control panel named “WPForms”. Move your cursor to it and a sub-menu will appear, now click on “Add New”. Enter your form name and choose the type of form you want to create from pre-designed templates or blank template to design a custom one. In my case, I just simply select “simple contact form” and save it. Get embed code and place it anywhere in posts or pages you want to show it. Now go to other options like Fields, Setting, Marketing and Payments as per your situation. All the options are simple to understand and beginners can do without an additional guide. When you choose “Signup forms”, you have to connect your email marketing service provider for collection subscribers email address. And for “Payment form” you must integrate Paypal account. It’s really really simple. 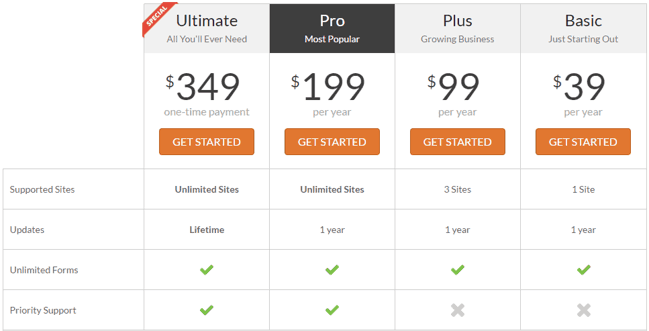 I have multiple sites, so, I would highly suggest you should buy PRO plan. With the Lite version, you only can use contact form building feature, it means without the purchase of a premium plan, you can only build simple contact forms. But for other features, you have to buy it. Feel free to buy any plan and use for two weeks if you don’t feel satisfied, just ask for a refund. They claim double guarantee and will refund 100% your money without any question. I suggest you should try it, 14 days are enough to judge any product for finding whether it’s delivering what the owner has claimed. To be honest, there is no doubt that WPForms come with lots of outstanding features, but there are some top pros and cons that you should know. I am using WP Forms wordpress plugin right now, and it is impressive. However, if I face any problem with it, I will update this WPForms Review to share my experience. It is always good to know everything about any product before buying it. After using it, I am fully confident to RECOMMEND WPForms for blogger, business owners, photographers, and writers. Anyone can use it on their site, its free version also available but limited to basic features. You have to buy a premium plan for getting advanced features. For anyone who is looking for easy to use, advanced, seo friendly and fast wordpress forms builder tool, try it out. Is it worth using? Did you have used WP Forms or going to try it? Please let me know your experience with this plugin.